Multiple Select for Layered navigation (Filters) extension by MANAdev makes store navigation more flexible and more user-friendly than standard Magento Layered Navigation. 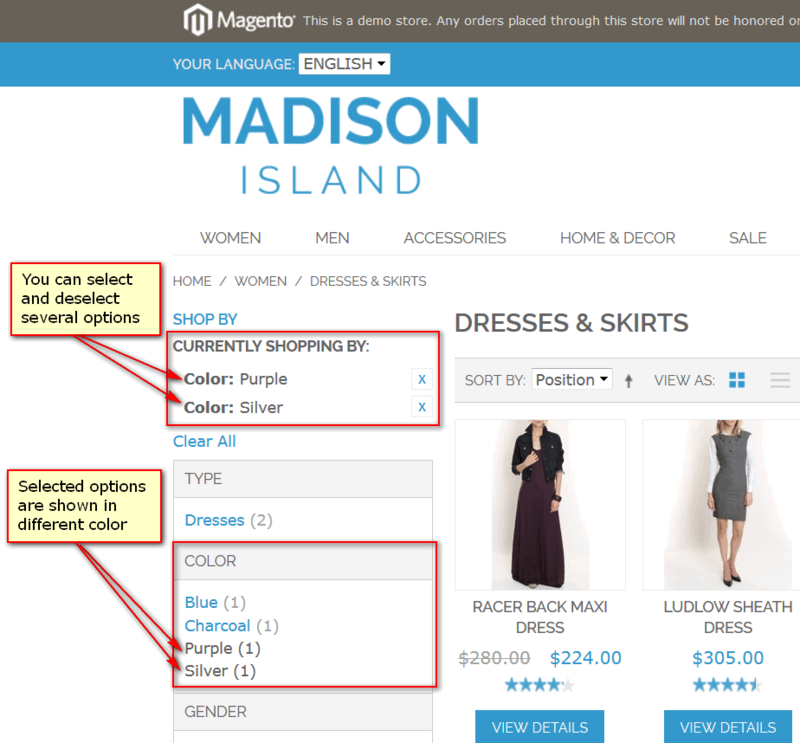 Extension give possibility to store customer to apply multiple values of the same filter criteria, for example, to select purple and silver dresses at the same time. Extension has no admin configuration, it just works. After installation store layered navigation visually will stay the same, however, system behavior on filter selection will change. When store customer chooses one filter item by clicking on it, product list is filtered and store customer still has possibility to choose and apply other item of the same filter. So you give store customer possibility to apply as many items of the same filter as he wants. Also, store customer can remove selected options in Currently Shopping By block. Note: You can read detail steps of below listed features in our FAQ section. Show Layered Navigation on Home Page (or any other CMS page). Hiding/Showing Filters in Specific Categories. Setting Category-Specific Filter Labels in Layered Navigation.